Oliver Ames senior Kyle Gagliardi finished his high school athletic career with a stellar season for the Tigers. While handling center field duties, Gagliardi was one of the top defensive players in the league. At the plate, Gagliardi led OA with a 0.477 batting average with a team-best 29 hits. He knocked in 13 runs and crossed the plate 15 times with three stolen bases. “Kyle was our team’s MVP this year,” said Oliver Ames head coach Joe Abarr. “He led the team in virtually every offensive category and did an outstanding job in center field." Oliver Ames senior Sam Burr had a tremendous final season with the Tigers. As the team’s ace, Burr had some dominant performances throughout the 2017 season. He posted a 1.63 ERA in 53.1 innings of work, earning a 6-1 record for his senior season. He also struck out 29 batters while allowing just seven walks all season long. He added 13 hits and seven runs scored on offense. “Sam was our team’s ace and a captain that went above and beyond expectations on the mound,” said OA coach Joe Abarr. “He always put our offense in a great position to come out on top." 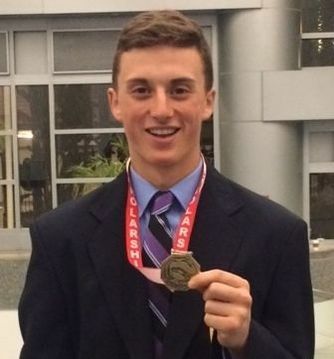 Alden Newman has been an integral part of the Oliver Ames DECA leadership as well as an outstanding, award-winning DECA competitor. As DECA secretary, he has given his time and talents to furthering the mission of DECA and to promoting the club to his fellow students. In addition, Alden has earned competitive success at the district and state levels as well as qualifying for international competition during both his junior and senior years. Alden was also awarded a national DECA scholarship at this year's International Career Development Conference in Anaheim, California. Alden was selected from among 1000 applicants and was only one of two students from Massachusetts to receive the honor.